Roc jams, 13 months old. 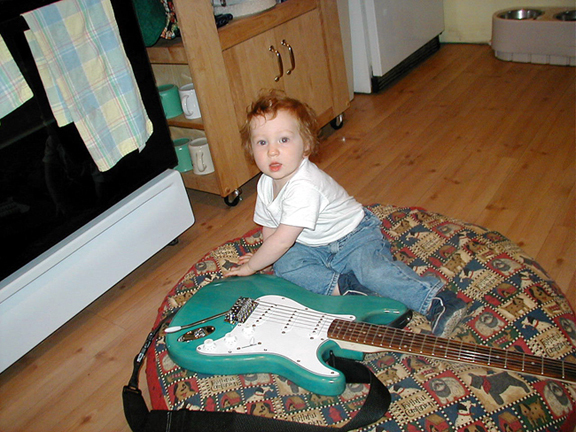 That’s when I decided to build Rocco a guitar of his own. If it gets relegated to the back of a closet so be it. It’ll still always have his name on it, still be a one-of-a-kind instrument made just for him. And if he actually does take an interest in playing his guitar, we can swap in better parts, or upgrade to a new instrument all together. Sure, Rocco’s only 16 months old and hasn’t even mastered holding a spoon yet. But he’ll grow into it. Someday, a decade or two down the road, he’ll develop the finger dexterity needed to tackle the subtle variations of a G chord. His guitar will be ready when he is.